Australia produced their worst effort of the ODI series against India in the decider last night, batting and fielding poorly as the tourists chased down a low total in Melbourne. Veteran MS Dhoni (87*) once again skippered India’s chase with quality middle order batsman Kedar Jadhav (61*) helping him haul in Australia’s total of 230. While some drama was injected into the chase thanks to Dhoni’s conservative approach, Australia always looked to be at least 40 to 50 runs short of a good total. Australia needed to bowl and field exceptionally well to defend such a paltry score and, while their attack did a good job for the most part, their fielding was awful. Dhoni was dropped twice, with both errors coming at pivotal moments. From the first ball Dhoni faced Glenn Maxwell dropped a sitter at point which could have left India reeling at 3-59. Later, Australian captain Aaron Finch dropped a tougher but still very catchable chance at mid-off from Dhoni. Had he snared that catch, India would have faced a stiff task, needing 27 runs from 17 balls with a new batsman at the crease. Earlier, Indian star Virat Kohli was given a life by Peter Handscomb at first slip when the Aussie turfed a sharp edge from the bowling of Peter Siddle. Siddle once more looked out of his element in ODI cricket, further underlining how farcical his selection for this series was after eight years without playing white ball cricket for Australia. So badly did Siddle struggle when asked to halt the charge of Dhoni and Jadhav late in the innings, that Finch had to drag him from the attack and instead use batting all-rounder Marcus Stoinis to try to close out the innings. Siddle finished what will surely be his last-ever limited overs international series with two wickets at an average of 81 and a sky-high economy rate of 6.48 runs per over. To underscore just how poor Siddle’s economy was consider that the other three quicks Australia used in this series – Jhye Richardson, Jason Behrendorff and Billy Stanlake – together went at just 4.31 runs per over. Richardson was outstanding again last night, bowling with precision and intelligence as he took 1/27 from his ten overs. That capped a fantastic series for the 22-year-old, who finished with six wickets at 18 while maintaining an extraordinary economy rate of just 3.73 runs per over. With Australia looking for a bowler to partner Mitchell Starc in the death overs, Richardson has now put himself right into World Cup contention. He surely will be in Australia’s squad for their five-match ODI series in India – which starts five weeks from now. The same should be the case for leg spinner Adam Zampa, who was highly impressive last night as he conceded just 34 runs from his ten overs. 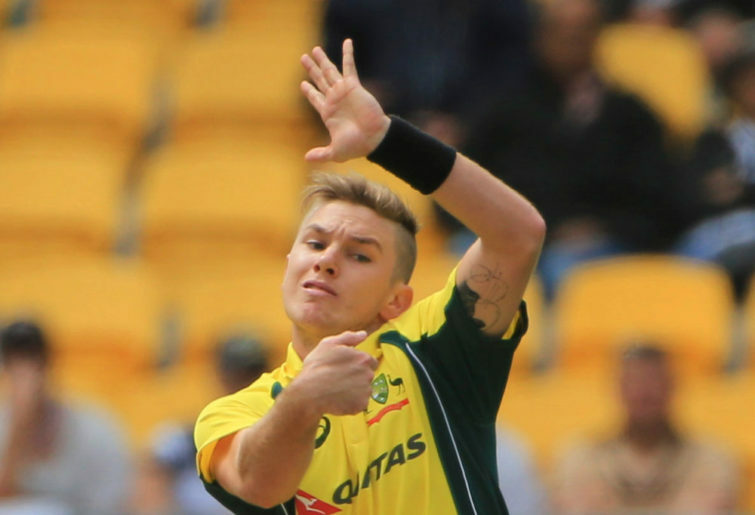 Given the enormous value of wrist spinners in modern ODI cricket, Zampa must be given generous opportunities on the tour of India to cement his place for the World Cup. Zampa had a great JLT Cup this summer, with 12 wickets at 25 from six matches, and followed that up with very frugal efforts in six T20Is for Australia in which he went at just six runs per over. The 26-year-old had a wonderful debut year in ODIs in 2016, taking 30 wickets at 27, but has since been treated shabbily by the selectors and his form has waned. With no other spinners pressing their cases to be picked in ODIs, the selectors need to give Zampa a chance to try to regain that kind of hot form. He and the Aussie bowlers last night were left with far too difficult a task after their batting colleagues failed to pull their weight. The top four of Aaron Finch, Alex Carey, Usman Khawaja and Shaun Marsh all looked scratchy and, by the time Australia fell to 5-123, any chance of posting a big total had evaporated. The sole positive, once more, was the sprightly batting of Handscomb, who is looking more and more like the kind of versatile accumulator Australia have long lacked in the middle order. In Handscomb’s knock of 58, he scored just eight runs in boundaries yet still managed to maintain a rate of just under a-run-a-ball. By comparison, the remainder of the Australian top seven relied heavily on boundaries, which is not a wise strategy on a ground as big as the MCG.